Rated 5 out of 5 by Peaches from 30-Year Celebration Magazine Printing was pricey for a church, but it had quality. Rated 5 out of 5 by ParksRec from Excellent quality and customer service! First time placing a large quantity order and the process was so easy and smooth. The product was delivered on time and it was exactly what we ordered. Rated 5 out of 5 by LuAnneEA from PrintPlace is so Easy to Work With! Our booklets look and feel professional. We are very pleased and will continue to use PrintPlace for all our printing needs. Rated 5 out of 5 by Goose 65 from McClendon Report loves PrintPlace Great quality and speedy service. I love the website and upload capabilities. Rated 5 out of 5 by JJbooks from Great Printing and Great Price I recommend PrintPlace for printing. I have been using them for years. Rated 5 out of 5 by BESS from High quality at the right price! This was my first time using PrintPlace. My theatrical programs turned out perfectly. All the instructions for using my own artwork were very clear. I needed a quick turn around and the staff was very helpful in helping me get what I needed. They arrived early and have the professional look I was hoping to get at an affordable price. Rated 5 out of 5 by John D from Quality work and on time The program was a show stopper. Everyone loved it. Rated 5 out of 5 by Maria from June program booklets We needed the program booklets within the week of placing the order. They got here with a day to spare. THANK YOU Printplace reps for making it happen. They look great. Rated 5 out of 5 by Crishtbel from Great work! O receive my Booklets a few days ago. I am so happy to choice PrintPlace for this important project. Thank you! Rated 5 out of 5 by Riverside from Excellent and eye-catching quality These booklets show pictures of all areas of a resort and are being used for marketing purposes. Rated 5 out of 5 by Programs from Beautiful, high quality booklets I was a little nervous to use a new printing company to print 1,000 booklets for a big event. I shouldn't have worried. Print Place had amazing customer service and the booklets were beautiful. Exactly what I wanted. I'll be using them again. Rated 5 out of 5 by TheREPTheatre from The REP loves PrintPlace! 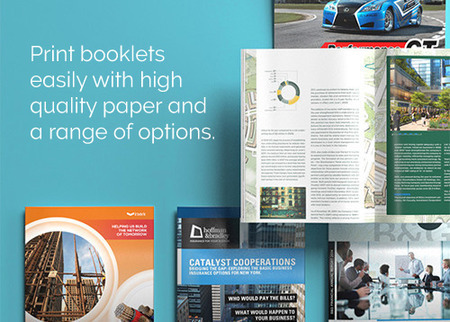 We exclusively print with PrintPlace and get so many compliments on our VERY nice looking booklets. These things are just beautiful with full color and heavy cover stock. People always talk about how professional they look and while I can take some credit for that, PrintPlace does a wonderful job printing these. Always excellent customer service and very helpful when issues pop up. Rated 5 out of 5 by postcard from Best Printers On The Net I have been using this online printing company since 2007 and every year they deliver consistently! Over this time they they have improved there process year after year. I like working with Print Place over all the other online printers (even Local printers). Even though I live in Ohio and they are in Texas it seems like they are in my back yard. I have been using commercial printers since 1985, and I rank Print Place at the TOP. I would give them 6 Stars if they offered it! They will make all your dreams come true! Rated 5 out of 5 by Daniels747 from GReat print quality We designed a booklet that was going to take careful print management to make sure the color quality and image alignment across gutters was correct. I was more-than-impressed with Print Place's performance on this piece...as always! Rated 5 out of 5 by LizS from Conference Brochures I have used PrintPlace for several years. Excellent service and very reasonable cost. Very easy to get technical support, which is prompt, efficient and helpful. When there was a problem with one order (a rare event), PrintPlace re-ran the whole job in short order and had it delivered back to us in time for our event. Rated 5 out of 5 by Dale from Awesome Quality Booklet We use the booklet as a lunch menu. The templates provided allowed for easy setup of our artwork. the print and quality of the final product was excellent. Rated 5 out of 5 by clintbieri from Better than we thought! Everything looked so good and their review process made everything pop! Rated 4 out of 5 by Brownstoners from Booklets We purchased booklets here and were happy with both the turnaround time and print product. Rated 4 out of 5 by tnewcomb99 from Great price, so-so paper There is no doubt that Printplace has great prices and service. I just wish their paper was as bright as the local print shops we often use when we want the best.